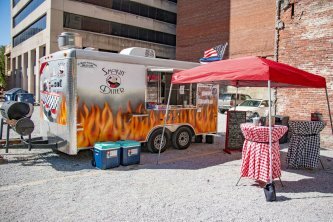 Slow smoked barbecue food truck in Wichita Kansas. Providing a gourmet array of smoked meats along with a wide variety of other dishes. At Smokin Diner we take pride in our work taking the time to ensure all of our dishes are gourmet and delicious. Our brisket, pulled pork, ribs, ham, turkey, hot links and other meats are all hickory smoked for 16 hours! We do more than smoking! We also offer a wide variety of cuisine including soups, salads, sandwiches, nachos, tacos, and more! We cater events of any size big or small with options and menus to fit any budget. Book us for your next holiday party, wedding, birthday or corporate event! Email us to book your event today!